Make sure you're using the right charger for the golf cart. Unlike with a regular car battery that charges as it's running, a golf cart does not have an alternator in which to do this. It should be a 3-phase charger and pay close attention to the position of the battery poles while charging. If you're using a charger that can't handle the job, or don't have it set up correctly, it could result in a quick dying battery that could leave you stranded. Distilled water is a must! Regular old tap water from the sink should never come into contact with the reservoir in a golf cart battery. Distilled water should be used to top off the battery cell's reservoir only. Make sure to pay close attention to the levels as to not under or overflow it. Quality is key. When purchasing a golf cart battery, it is a smart move to get one of the more expensive batteries. It's easy to get the cheap ones, but eventually, you'll have to get another cheap one, and another, and another. All those add up when you could have gone with better quality for a bit more money and saved yourself the hassle and constant returns to get a new battery cell. Corrosion is just as bad for a golf cart battery as it is for a car battery. Keep an eye on the connections and posts of the battery. If you're continually killing the battery and having to charge it longer each time, it creates too much heat and can damage the battery. A lot of making sure your golf cart’s power lasts all day is basic maintenance and checking on the state of the battery in and out of use. 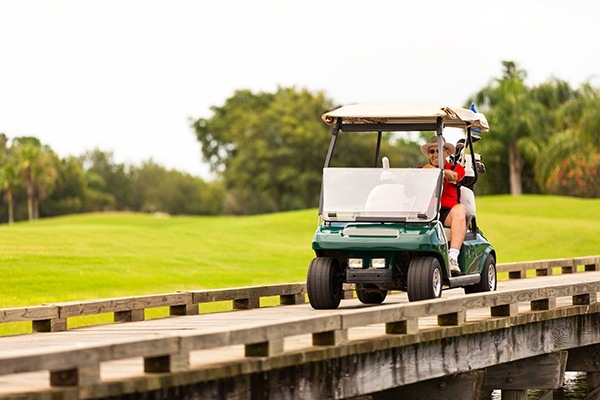 Investing in a top grade battery from Battery Power, charging correctly, and using required and correct fluids will make sure your golf cart runs all day, any day.